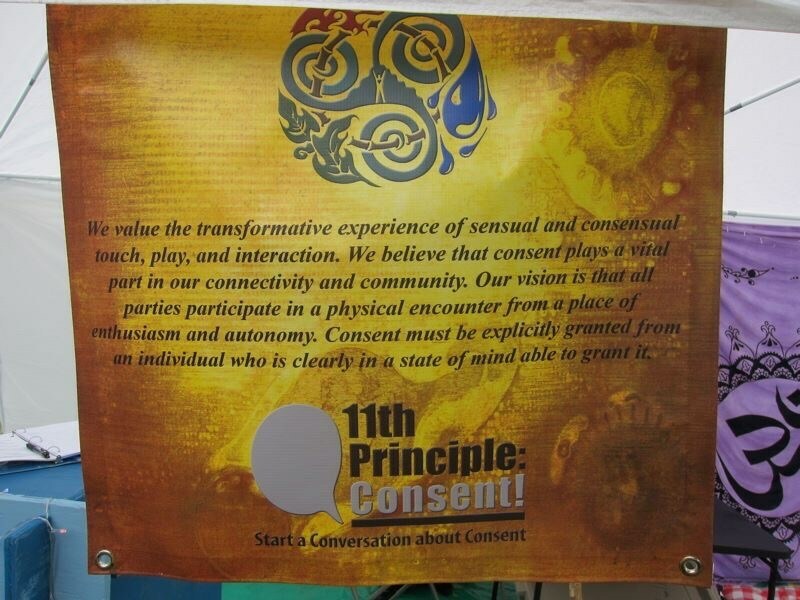 Vision & History of the 11th Principle: Consent! – 11th Principle: Consent! History of the 11th Principle: Consent! The 11th Principle: Consent! was founded in late 2012 to address the issue of non-consensual encounters at burns, specifically our home burn of Transformus in North Carolina. In late 2012, after the widely publicized sexual assault issues at Burning Man that year, and other consent issues within the community, a group of Southeast burners began to talk about how to take responsibility for our community and the issues inside of it. With much support from the BOD, founding members PyroCelt, Beth Walker, Jaime Chandra, Ranger Cervix and others spearheaded a multifaceted effort for Transformus X in 2013. They received abundant support and feedback throughout the event and continue to approach the issue in a lighthearted yet respectful manner appropriate for the burn community. The 11th Principle differs from similar consent-oriented groups in our belief that one does not need to be 100% sober in order to consent. Rather, we know that this issue is full of gray areas and believe that there is a difference between having had a couple of drinks and being completely intoxicated. Our consent education efforts pinpoint several markers of intoxication that likely precludes one’s ability to consent. At the forefront of our effort was an intention for people to think and talk about consent. Additionally, there was hope that our efforts would affect not only our immediate community of Transformus, but go beyond to burn culture and possibly even affect the global community. In 2015, we were asked to present our efforts at the Burning Man Global Leadership Conference. 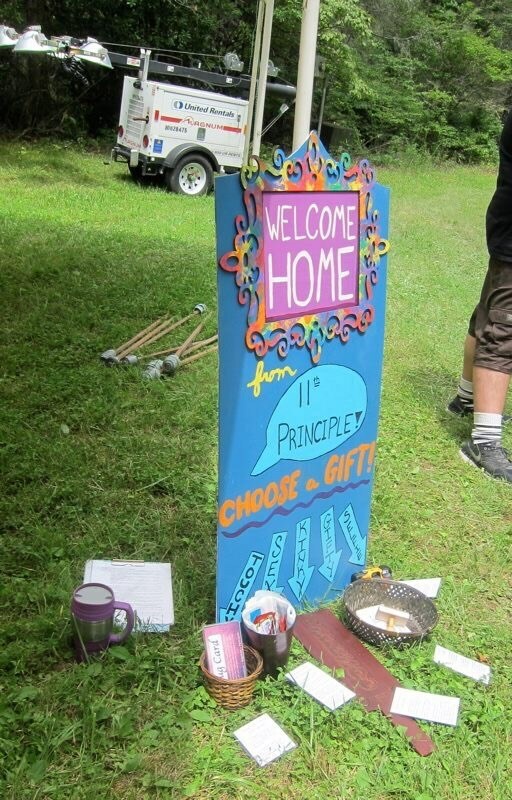 The amazing Beth Walker compiled a thorough presentation of the 11th Principle’s efforts & Cervix made the journey to the GLC. We highly recommend you view the PDF: Summary of 11th: Principle Consent! Educational Materials and Efforts, prepared for Burning Man Global Leadership Conference 2015. That same year, Jaime Chandra with the help of Lizifer VonFunshine, Ranger Cervix, Kayln TinTin, and Beth Walker, made this website to serve as a repository for our materials so that other burns and festivals could make use of them to create a consent education initiative without all the work that we put in. We wanted to make it easy for anyone who wanted to educate about consent. In 2016, Jaime Chandra implemented the inaugural Consent Crowdfund where $882.47 was raised from 47 total donors during the month of June. The money donated went to lots of swag and supplies for the Transformus team and there is a 2016 financial transparency document published. Since that crowdfund was so successful, we held a second one in 2017, which helped fund only Ignite since Transformus was cancelled. A total of $819.22 was donated by 35 total donors and there is a 2017 financial transparency document published. For the 2018 Crowdfund we teamed up with the amazing artist april h l to expand the design offerings and we exceed all expectations! We began offering bulk orders to community activists, theme camps, regional burning man events, and others which created a year-round need past our crowdfund. $4133.51 was raised from 134 total donors and there is a 2018 financial transparency document published. For some silly reason we never thought to offer bulk ordering before and that allowed us to seriously expand our impact to the point of needing an official non-profit organization. The crowdfunds expanded the awareness of the 11th Principle: Consent and our bulk ordering offering increased our impact. The conversation around consent grew in a big way after #metoo became viral in October 2017. In order to meet the growing need for consent resources and education, we started the non-profit organization Enthusiastic Consent in July 2018. We will now be shipping consent materials year-round and are looking to expand our offerings to include laminated porto fliers, new swag options, and eventually online trainings. Also in the works is a consent theme camp that can travel with volunteers to various regional burn events. Stay tuned for the exciting developments and keep an eye on things with our ongoing 2019 financial transparency living document!